The characteristics of rotary-wing aerodynamics at the MAV scale are different from those in higher Reynolds number environment. There are two main factors that govern the hover performance of a rotor and these are induced power and profile power. The induced power of a rotor arises from the momentum change of flow generated through the rotor disk, whereas the profile power arises from viscous effects including flow separation over the airfoil. We have carried out systematically hover tests on a two-bladed rotor (dia. 15 cm) to examine its performance due to variations in airfoil camber, leading-edge shape, planform and pretwist, for a tip chord Reynolds number of 40,900. A special rotor test stand was built wherein a balance was used to measure the thrust and torque. 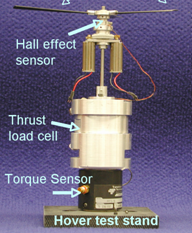 The hover performance was compared in terms of rotor figure of merit (FM) (ratio of ideal power to actual power). 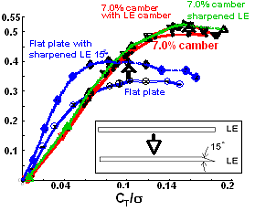 Cambered plates with maximum camber ahead of the mid-chord, and sharp leading edge exhibited the best hover characteristics, resulting in high figure of merit. Test results showed that an optimum camber is about 6.75% of the chord. Rotor blades with linear distribution of airfoil camber further improved the rotor efficiency over blades with uniform camber. Planform parameter variations that optimized camber and twist distribution raised the figure of merit by reducing the profile and induced power of the rotor. 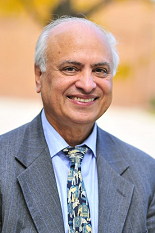 The effect of planform taper and pretwist was generally found to be small. 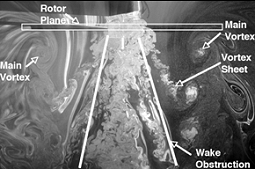 A laser flow visualization experiment of the rotor wake was performed and the visualization showed evidence of highly non-ideal inflow and spanwise distribution of lift. Also, a plot of power loading as a function of disk loading for a range of rotational speeds showed that any disk loading, there is specific combination of rotor speed and collective angle at which power loading is maximum. Figure 2: Rotor performance at Reynolds number 40,900: effect of airfoil profile. Figure 3: Flow visualization using laser sheet at wake age for 7.7% cambered blade, 2.75% thick, sharp leading edge ( =.149).